A Catholic woman in her late 50s was punched and thrown to the ground by three marchers as she tried to cross a sectarian parade by the Royal Black Institution in Ballymena on Saturday. All three wore Black Institution regalia and were part of the parade. Thousands of people took part in anti-Catholic Royal Black Institution parades across the North on Saturday. Mary McKeown was crossing Broughshane road in Ballymena to go to a hairdressers when the marchers beat her. Her son, Don McKeown, says she was treated for her injuries at Antrim Area Hospital. “She was punched in the face, she was hit on the back of the neck and her fingers are dislocated. “This was just thuggery, absolute thuggery,” he said. Local Sinn Fein representative Monica Digney said she visited the victim following the attack. “I was shocked at what I saw. This lady, who is almost 60-years-old and who suffers from ill health was trembling with fear and clearly traumatised by this frightening experience,” she said. Ms Digney said the woman was crossing the road when a gap appeared in the parade. “She was grabbed by a man wearing a Black Institution sash who attempted to stop her. “She managed to break free but as she reached the kerb she was grabbed by the coat and punched on the face by another male,” she added. Ms Digney said she will be asking for a meeting with the local PSNI police chief to discuss the incident. SDLP Assembly member Declan O’Loan also said he had visited the victim and would be reporting the incident to the Parades Commission and the PSNI. 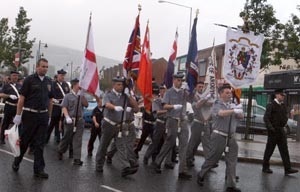 * Another major parade took place in Newry, where local nationalists endured thousands of unionist bandsmen and supporters who were bussed into the overwhelmingly nationalist city from across the Six Counties. eirigi described the march as “a sectarian coat-trailing exercise” which brought Newry to a standstill for several hours drunken unionists playing sectarian songs and waving paramilitary emblems and flags. The PSNI sealed off all main roads to Newry for the march, which prevented residents and motorists from travelling anywhere near the town centre. eirigi General Secretary Breandan Mac Cionnaith said: “It’s unreal that, in 2010, nationalists are either hemmed into or are too afraid to leave their homes because of unionists indulging in sectarian intimidation in a predominately nationalist area. “In recent weeks, unionists erected provocative flags on the outskirts of Newry in an attempt to intimidate nationalists and now they are coming into Newry in their thousands from all across the Six Counties in an exercise of intimidation against nationalist residents. “The parading of this bigotry by unionism all too often ends in violence, as was seen with the sectarian assault on a middle-aged woman in Ballymena at the weekend. This is the reality that the promoters of sectarian processions need to face up to. * In north Belfast, a protest by nationalist residents over a Royal Black feeder parade through the highly contentious Ardoyne interface was called off at the last moment “in a bid to boost dialogue”, according to the Greater Ardoyne Residents Collective (GARC). Members of opposing residents groups, the more activist GARC and the more moderate CARA (Crumlin and Ardoyne Residents Association), barracked each other as the early morning parade passed.